Home › Final Few Years of British Steam: Part One Summer 1958 - Summer 1966 Wheeler. Final Few Years of British Steam: Part One Summer 1958 - Summer 1966 Wheeler. Grange Publications and Les Wheeler, Shilbottle, 2017, 1st edition softback, near fine, laminated, pictorial card wraps 264pp, illustrated throughout from b/w photographs, no inscriptions. Practically pristine copy. 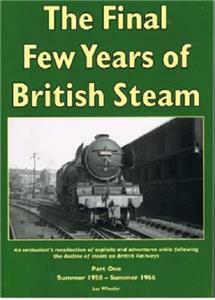 An enthusiast's recollection of exploits and adventures while following the decline of steam on British Railways.